Last Christmas, I was given a dala horse cookie cutter by a good friend of mine. 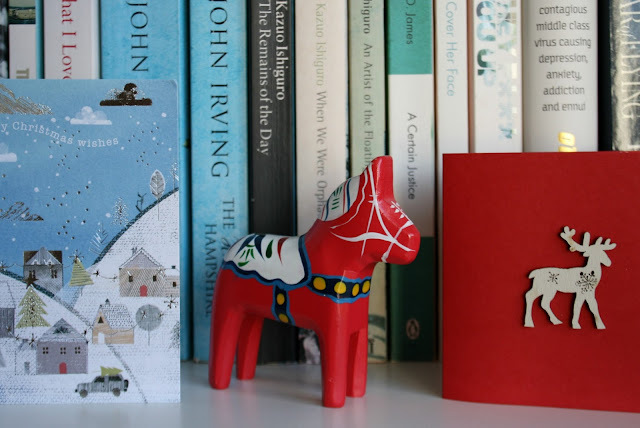 I like Dala horses, like their stocky shape and colourful patterns, their roots in Swedish history and folklore, and find them totally charming. I have a couple I brought back from a holiday in Copenhagen a few years ago; a little bright red one bought at the airport in a tacky souviner shop, and a classier blue and white one purchased in the glorious Illums Bolighus department store in the city centre. I wouldn't say I collect them, but if I were to see one in a charity shop I'd snap it up. I have for a long time wanted to make some iced dala horse gingerbread biscuits - partly to give as gifts, but mainly for my own amusement - and so today, while it the weather was vile outside, I baked. The plain gingerbread doesn't look particularly inspiring. First I tried white icing on brown but as you can see, it looks like a child did it and I actually tried really hard here. Those people who bang out 48 identical iced biscuits on the Great British Bake Off while under time pressure...well, hats off to them. So I covered each biscuit in while fondant icing. Rolling and cutting these shapes out was sheer pleasure after the icing pen traumas and they instantly looked...less brown. And then out came the red icing tube and while I attempted to draw on some horse related decoration. They don't look quite how I imagined they'd turn out, but I rather like them. The red and white is Christmassy and the simple shape and decoration is enough. But most importantly they were fun to make. Not everything has to be perfect (this is a revelation for me!) and sometimes it's just enough to spend an hour or two in the kitchen making something nice. When the red icing has hardened, they can be piled up and put into cellophane bags or boxes to be given as gifts. Or you can just eat them - they keep really well in an airtight container. We'll be giving some away and eating the rest. And while all this was going on, Bella and Angus were engrossed in their own biscuit decorating. After I'd showed them how to roll out the fondant icing, I just gave them total free reign to decorate their gingerbread hearts with whatever they could find in the cupboard. I think you'll agree that they outdid themselves here. A close up is necessary so you can appreciate just how fully loaded these biscuits are. There are personalised ones too...M&D for mum and dad. Lucky us. It was one of those rare harmonious kitchen moments; the children shared the rolling pin and did not bicker, I did not shout, the radio was on quietly in the background. The kitchen was a complete disaster by the end of it, with icing sugar over every surface and cake decorations crunching underfoot, but we had a lot of gingerbread to eat and that is always a good thing. Joining in with Jennifer's Winter Project Link Party. What a lovely way to spend a nasty weather day. The dala horses look great and the kids have done a 'wow' job with their decorating. I do hope that the M & D didn't mean you had to share only one of those hearts (giggle). Hope the weather improves and take care. These are wonderful, especially the children's. My daughter requested our Christmas biscuit recipe the other day and I love that even in her student kitchen she is rolling out the dough with a wine bottle and stamping out with a glass. You really can't beat a spot of baking on a winter's afternoon. Thanks for joining in with my link party, Gillian. They look wonderful. I love your horses, the red icing is a perfect touch. We're planning to bake cookies next weekend. I have to donate several dozen to the school for a fundraiser held the week after this coming one, so I want the cookies fresh for then. I'm sure we'll have just as much of a mess here, but like you, it's okay if everyone is enjoying themselves. Wonderful cookies, they are so pretty, almost too pretty to eat! They look pretty and I'm sure they taste delish too! I am glad you had some harmonious kitchen time , too, with the littles. It can go pretty bad pretty fast but it seems you've made it through with flying colours! Have a great week! The horses and hearts are lovely, and I imagine the sounds, sights, scents and the warmth in your kitchen during that afternoon. Together with your children, you made a precious memory there which will stay for them all their lives. Because somehow I'm all about foxes this year, my Mum bought a fox-shaped cookie cutter at the Christmas market last week and made fox-shaped Christmas cookies for me! She gave me a whole batch yesterday. They are almost too cute to be eaten. I love your little red Dala horse, it looks so festive sat on your book shelf. The cookies look very tempting even un-iced, I bet your house smelt wonderfully Christmasy while they were baking. The children obviously enjoyed themselves too, it will probably be one of those things that get remembered in years to come. Love that blue and one one, I do have a blue one that I found in my local Fara shop always on the look out fot them! Ginger bread ones are a perfect idea. I love both the Dala horses...! Your Dala horses look amazing! What a blissful activity. Love these. I have a wooden christmas-tree ornament that looks very like your red and white gingerbread horses! Fondant icing is a great idea. Lovely, lovely, lovely. I have bought a xmas tree cookie cutter this year. It's from Sainsbury's and you slot two biscuits together to make the tree free standing. I haven't had a trial run yet, but they are for teacher gifts. It always surprises me how many people don't bake. What beautiful horses. I bet your house smelt amazing - all that lovely ginger. Your children clearly had a great time too. I love their decorations! Oh yes, that works well! I'm always depressed by the decorated biscuit. It never turns out as lovely as I imagined. The fondant gives a beautiful base though. Glad you got some happy and peaceful kitchen time. A rare and wonderful thing! They look amazing, the perfect gift. Lovely that the family got involved, precious family memories. All of the biscuits look great, very colourful! I have a wooden one which Jay gave me for Christmas last year and would gladly start a little collection. Apparently they used to be used as currency in some parts of Sweden. I love that idea. Ok, I have to ask: how does the fondant icing stick to the cookies? I have only ever used it (once) to top my Christmas cake and recall rolling it out and gluing it down to the marzipan layer with beaten egg white. As it was, rolled out, it was dry and easy to handle, but I can't see how it would stick to cookies. Having struggled with icing gingerbread myself i think this is a perfect solution...but how does it work?